I’ve written about this topic here and here before. In those posts I argue that there is a better question for counselors to consider than the one of culpability. Last night, we started the 2012 edition of Counseling & Physiology with the question of culpability and whether or bodies/brains can cause us to sin outside of our will. We also looked at our tendency to focus on judging whether a person is culpable for their sins (e.g., someone with Tourette’s who swears, someone with a TBI who is easily enraged, someone who is chronically anxious or still another who falls prey to addictive behavior). One of my main goals was to get students thinking about whether they under or overestimate the body’s role in counseling problems. Doesn’t the fact that you will choose how to respond to a client indicate that you have to judge the cause of the problem? If you encourage a client to consider psychoactive medications, aren’t you suggesting it is a body problem? If you focus on habits or heart issues, aren’t you assuming the problem is primarily a spiritual, will or behavioral control problem? This was a great question and my answer was something like the following. No and yes. Functionally, you will choose an area to work first. This does not mean you think that the type of intervention you choose indicates the main problem. It may only indicate that you think one intervention is an easier entry gate to counseling than another. Here’s an example. Even if my client is severely depressed and I believe that the primary cause of this depression is their longstanding bitterness and anger towards God, I may encourage a psychiatric evaluation and the consideration of an antidepressant. It may be that once their mood improves, we can make better progress in investigating some spiritual matters in their life. Have you ever thought of the various sources of human sin? Here’s a visual of all of the things I think of that are a part of nearly every human sinful behavior. The sizes of the factors surely change depending on the situation. For some, will, high-handed rebellion, may be most of the pie. In other cases, bodily weakness may be the prime source. Also, some of these surely overlap and are not distinct. I may have started out in a rebellious state when I started doing drugs. Now, my body and psychological habits are equal players in why I maintain a drug habit. What else would you add to this chart? Note that I place “will” in the smallest concentric circle. I imagine that we have far less conscious control over sin than we sometimes ascribe. 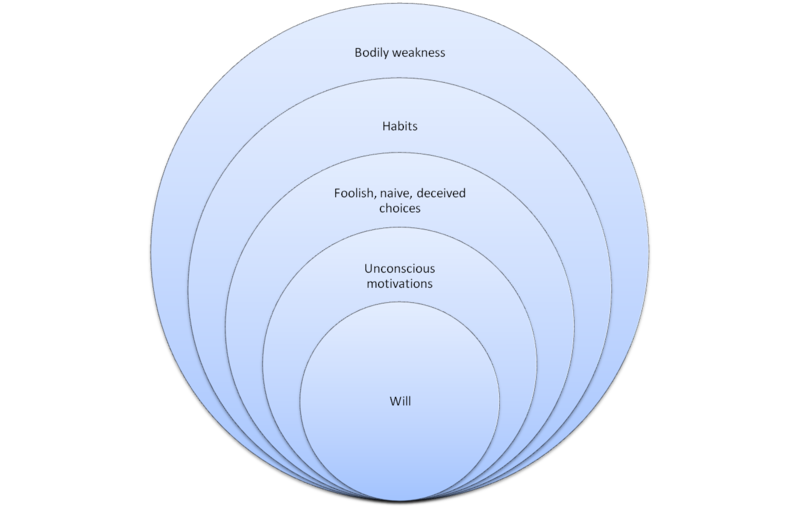 Habits, unconscious motivations, and foolish (unthinking) choices probably dictate more of our behavior than our direct, willful, planned rebellion. Of course, none of this has ANY influence over culpability or morality as Scripture clearly indicates our guilt even when we are unaware of the Law’s commands. When Jesus says, “Father, forgive them for they know not what they do,” it tells us that consciousness of sin has little to do with our need for forgiveness. 2nd Post: Can Your Body Make You Sin? Over at Biblical Seminary’s Faculty Blog you can read my second of two posts on the topic of bodily weakness, sin, and culpability. I conclude with the realization that there is something more important in this conversation than ascribing blame or parsing fault. I’m curious about your thoughts. How much does culpability really matter when determining your response to those whose bodies seem to cause them to sin? Regular readers will notice that I have posted little of late. The combination of too much to do at this point in the semester (2 weeks to go!) plus nothing much to say are the reasons why. However, I have a new post over at the faculty blog at www.biblical.edu. This post is a version of a short essay that I wrote for the AACC Christian Counseling Today magazine in 2006. Here’s the problem with answering this question. The fruits of repentance are quite hard to distinguish from their counterfeits. Tears, words, and time are poor estimates of true repentance. However, there are some very good evidences of repentance. Click GRACE Repentance for my 3 signs every church leader should know. Human moral frailty is never singular. Meaning, we don’t sin with just one sin. Every moral failing includes at least 3 parts: deception, action, cover-up. Think of deception and cover-up as bookends and the specific behaviors as the books in the middle. And just as it is hard to keep books on a shelf without bookends, it is hard to do what we know is wrong without deception of self and cover-ups. What are your versions of bookends that give you “permission” to hate, to excuse, to overlook your faults? Knocking down the bookends goes a long way to defeating outward sins like abuse as well as inward sins like festering bitterness. 1. Nothing is done by a person apart from their cells. We mediate all worship, desire, etc. through our cells. When we do good or evil, all of us are involved. 2. Sin is not merely an act, but a disposition. All of me is tainted and not functioning as it was originally intended, including my physical body (and don’t I feel the effects of being over 40!). The dualist position is more in danger of treating sin as only what we consciously choose. 3. I don’t have to know that I broke the law (biblical or federal) to be guilty of violating the law. I didn’t know I was speeding but I still got a ticket. In the OT, lack of intention or knowledge violating the law did not protect against impurity or guilt (e.g., Lev. 4:22; 5:3). 4. If the body is broken and under sin’s curse it stands to reason that our bodies function in ways that are out of accord with our will. If they can move without our control (e.g., Parkinsonian tremors) can they not also move in such a way that violates God’s design for us. We have scientific evidence of this. Stimulate a certain part of the brain, and you will have rageful feelings. Stimulate another part and you may have sexual thoughts. Consider, as a commenter suggested yesterday, a person with Tourettes. There is some evidence of temporary volitional control (a surgeon is able to stop a tick during an operation) but other evidence that the ticks, and in some cases, curses burst out against the conscious effort of the person. If we accept that our bodies can act against or without the will, what do we gain or lose? I think the primary concern by many would be that somehow we will either be held culpable for sins we didn’t want to commit or claim innocence for sins we didn’t willfully commit. And this gets to our thinking patterns here in the West. We want to be only held accountable for things we did do and not held accountable for things we either didn’t do or didn’t have any control over. It strikes us as evil to be held accountable for that which we didn’t know was wrong. I once got a ticket for making a u-turn on a Chicago city street at 11 pm when no one (but the cop!) was around. There were no signs. I wasn’t familiar with Chicago rules, was lost in an unsavory neighborhood. And yet I still got the ticket. It didn’t seem right. But I did violate the law. Our American judicial system isn’t the only system that holds us accountable for involuntary acts. Romans teaches us that because of Adam’s sin, all are sinners. I bear the culpability for his sin (and I make plenty of my own as well). I bear the impact of his choices in my entire being. Further we see OT prophets confessing the sins of the community as if they were their own. So, in short, I think we can answer yes to the question about whether our bodies can make us sin. They can because we (body and soul) are tainted by the Fall. It doesn’t make us more or less out of sorts with God whether our sin is chosen or involuntary. Happily, God doesn’t just forgive willful sin, he forgives sin period and makes it possible to not sin by imputing his righteousness to us. For those still thinking about culpability, I’ll give a little vignette tomorrow to chew on.